Welcome to our Florida Keys Fishing Reports section. Here we will be posting all the catch reports both offshore and backcountry around Islamorada and the Florida Keys. Remember all captains can be booked through Bud N' Mary's Florida Keys Fishing Charters by calling 1-800-742-7945. Islamorada Fishing Reports vary year round, so check back often! Thanks! To see older fishing reports, scroll to the bottom and click the page numbers! P.S. You can also read Capt. Rick Stanczyks daily updated fishing reports here or daily tarpon reports here (during season). We moved right through November and are almost two week through December? I just can't get over how fast this year is flying by!!! The Islamorada Sailfish Tournament took place almost two weeks ago and there was some excitement on the reef! Some boats had very slow fishing but the last day was much better than the rest and the team aboard the Cloud Nine managed 8 sails the last day to put them in 3rd place! They had 3 sails one day, 1 the other day, giving them a total of 12 fish over the 3 day event. The past 5 weeks we have had a decent sailfish bite overall. The boats that have been putting their time in have had a few shots most trips. Other reef action has included a few wahoo, some late season mahi, blackfin tuna, yellowtail snapper, mutton snapper, king mackerel, barracuda, and black grouper. Further offshore we have had some really active days on the humps while live baiting for blackfin tuna too. The swordfish bite was very good the past couple weeks. We landed two double headers and 2 fish over 200 lbs. Most of the fish have been in the 40 - 80 lb range but we had a couple others around 100 lbs. I had the pleasure of fishing baseball hall of famer Wade Boggs in Late November. He was chasing his first ever swordfish. 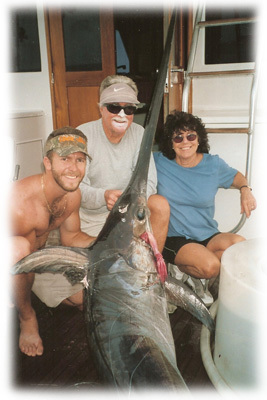 The first day we lost one near the boat, but a couple days later we got back out and managed 3 broadbill swordfish! We also had a bonus pomfret one trip. We also caught a few big queen snapper one day heading offshore for swordfish. Last winter was the best swordfishing we saw for the year so if you want to give it a shot now is as good as time as any as long as the weather cooperates. If not, you can always fish the reef! Give us a call in the marina office at 305 664 2461 if you want to book your next Islamorada fishing charter and we'll set you up on a great boat! Remember we have lodging options available at the marina including motel rooms, a couple small houses, and a few houseboats. "Galley Girls" cafe is open at 6 am daily now so you can get breakfast and lunch before you go fishing. Well we are into December and the year is almost over! Fishing has been nothing less than stellar in our backcountry waters. It's truly unbelievable the numbers of redfish we have continued to see. Days spent targetting them specifically have yielded 50 or more on the regular. Areas where we have not seen redfish in years are loaded with them, and even some areas where we hadn't really ever seen redfish - hard to beleive! Not sure if these fish have been pushed south here because of the red tide up the coast or what, but we are happy to have them. They should provide great angling opportunity for years to come, and they are a common target for us in the winter. Other than that, snook fishing has been really good as well and of course with the multiple cold fronts we've had, there have been some black drum and sheepshead around too. I myself a couple days ago had a couple anglers land a big 30 lb black drum which was cool, one of my favorite winter targets are those big drums that we seem to only get on the coldest days. We also had a lot of big snook and some redfish as well. Capt. Mike Venezia and Capt. Eric Ehelers also had similar fishing that day with snook, drum, and redfish, and a big drum for Capt. Venezia! Last week I had Ricky Walker and Paul Young of Scotlands Hooked on Fishing. We had a ton of redfish and nice snook, several black drum, and 3 juvenile tarpon, plus plenty of trout! It was an epic day. A couple days later it slicked off and got warm and a bunch of big tarpon showed up. They weren't chewing for us, but after a couple patient hours, Ricky landed a big 150 lb tarpon! Also some goliath grouper and redfish that day as well. There have been some tripletail in the gulf too as well as the occasional Cobia. We had cobias a week or so ago too, and Capt. Bill Bassett yesterday had a nice 40 lb cobia. Capt. Mike Bassett has reported some mackerel in the gulf. The mackerel bite has not yet been real consistent, we've had to run further than usual likely due to some bad water in the near gulf. But thankfully we have had plenty of other great options. Capt. John Johansen has reported great patch reef fishing with some porgy, hogfish, and snapper out there. Capt. Skip Nielsen had some nice red and gag groupers out there too, and a good day in the backcountry a few days ago with all the usual suspents drum, reds, snook, and trout. Capt. Vinnie Biondoletti had a very nice 12 lb redfish a few days ago. Capt. Chris Daly a couple weeks ago had great mackerel action on fly, and a few nice cobia on fly as well, plus big goliath grouper. For the immediate future, we have a couple more cold fronts coming in and it will be dropping back down into the 50s in the Keys. I'm licking my lips because this should be great for our backcountry winter time stuff... Big snook and big drum time! We have plenty of guides with plenty of openings all this week, including myself, so don't miss out on a great fishing opportunity! You may have to bundle up but once you get into the backcountry it'll get nice and you should have great fishing. January will likely be a great month for this as well as we are already have much cooler weather than we've had this early in our winter. Give us a shout to get your fishing trip booked at 305-664-2461! November is here and Fall is in the air. It's still warm by many peoples standards, but it's definitely a noticeable difference for us that live here. Temperatures are more in the low 80s and in the 70s at night, as opposed to those sweltering 90+ degree days. We've had a few minor 'cool fronts' that have helped cool things off a little bit too, and the more northeasterly winds always feel much more invigorating as well. Fishing has been very good for the most part in the backcountry. It's really been a mix of things with the tarpon fishing starting to slow down some what, at least for the larger species. But things like snook, redfish, trout, tripletail, and more have been plentiful in the everglades. Redfish in particular are showing back up in force, and I think we will have a great winter time fishery with them. They'd been few and far between the last couple years so it's great to see so many of them returning. Spanish mackerel are starting to show up out in the gulf as well, and that should only get better as things cool off more. Patch reef fishing has even started to turn on somewhat and again that will be better as things get colder. Some smaller tarpon are still around the bridges and channels, and plenty of them in the backcountry areas too mixed in with snook and redfish. Bonefish fishing has been good as well, we've really seen quite a resurgence in bonefish in the last year. One thing that Irma may have helped out with, in conjunction with cleaner water at least locally around the Islamorada area. We've seen 0 effect from the 'red tide' menace that plagues the west coast, in fact that may be one reason why the fishing has been so good here as it's pushing more fish further south to escape that nastyness. While we do continue to fight our normal algae blooms in the bay, there are still plenty of areas to fish where the water is perfectly clean, and most of that usually subsides as things cool off in the winter and the northerly winds blow it out to dissolve in the ocean and gulf. If you are looking to come down, November is a great time for mixed bag action here in the Florida Keys. We have discounted room rates available through Bud n' Mary's Marina, and guides are still offering their 2018 prices which are slated to go up a bit in 2019. Come check it out! Sorry we've been slacking on the Islamorada Fishing reports on the blog here. Social Media has really taken over our daily updates, so Make sure to Follow Bud n' Mary's Marina on both facebook and instagram. Here's a report from the last month that should get you pretty excited! In early and Mid October the offshore fleet had some great days live baiting for blackfin tuna on the humps. The bite wasn't on every day, and the tuna did slow down the last couple weeks, but it was on fire for a lot of trips! A few weeks ago We had calm weather with tons of pilchards around, which we netted hundreds, and the boats were able to get the blackfin tuna popping right behind the boat! It was a battle most days to get them past the sharks, but we saw a lot of fish in the 5 - 12 lb range and some in the 20-25 lb range. Hopefully they turn back on this month like it usually is in November. Back on the reef some of the boats racked up the numbers sight fishing for sailfish the last couple weeks! There's been some sails outside the edge of the reef too but the days multpile boats had 7-11 releases each they were up "showering" (chasing ballyhoo) in 20 - 30 feet of water! Thats some of the most exciting fishing we see here in the Florida Keys. Yesterday was good on them again with A couple boats having 4 releases and a few others released amongst the fleet. The upcoming months are prime time for sailfish! On the edge of the reef and wrecks There's been a couple tuna caught on the live baits, quite a few king mackerel, and the snapper bite has been decent while anchored down too. We saw a few black grouper the last week as well. Grouper will stay open till the end of the year and then shut down for 4 months. Way offshore there was a couple great weeks of swordfishing. The catch 22 caught 5 fish one day, another day with 3, and a couple days with one. The fish were anywhere from 40 - 120 lbs. On the Broad Minded We had a few slow days the past month missing our only bite on those trips, but then we had a few days with 3 fish, a few with 2 fish, and a few with 1 fish. A couple of the fish were really nice ones weighing in a 238 and 366 lbs! Most of the fish were 40 - 170 lbs. The next couple months is a great time to try for a swordfish, so if you want to give it a shot let us know! We have a handful of boats that fish for them! We had a few mahi last trip, but it is the end of the season for them so they were be a bonus anytime from here on out. Give the marina office a call at 305-664-2461 to book your next trip! Remember we have lodging options available and the Deli is open for breakfast and lunch.